YEREVAN—With hundreds of thousands of people gathered at Republic Square beginning early morning hours on Tuesday, Armenia’s National Assembly convened an extraordinary session at noon to elect a new prime minister, for which opposition leader Nikol Pashinyan was the only candidate who after a dramatic almost 10-hour session did not receive the majority of votes to occupy that position. Receiving 45 votes of the needed 53 the parliament failed to elect a new prime minister. A second election will be scheduled within seven days for the national assembly to elect a new prime minister. During a marathon parliament session that lasted almost 10 hours and broadcast live not only to the thousands gathered at Republic Square but to a worldwide audience, the Republican Party of Armenia staged what can be equated to a filibuster with its parliamentary faction members took to the dais to argue against electing Pashinyan as prime minister, citing a myriad reasons among them the threat of war looming over Artsakh and, once again, focusing on Russian-led initiatives such as the Eurasian Economic Union and the Collective Security Treaty Organization, to which Pashinyan had voiced his opposition as candidate and parliament member. Late on Monday night Pashinyan, in a Facebook Live post, warned that the Republican Party of Armenia had emerged from secret talks led by ousted prime minister Serzh Sarkisian and was planning to sabotage the parliamentary voter, despite the fact the party had pledged to not introduce a candidate and would not interfere in due parliamentary processes. The discussion often turned angry as sides accused one another of not having the best interests of the country in their approaches. Members of Pashinyan’s Yelk Alliance took turns to underscore that the hundreds of thousands of people who have taken to the streets since April 13 were fed up with the Republican Party of Armenia’s corrupt rule that has resulted in poverty, a disregard for social justice and citizens’r rights and have forced thousands to leave Armenia, because the people were not able to determine their own fate under that rule. In a dramatic twist during the parliament session, Armenian Revolutionary Federation bloc leader Aghvan Vartanyan broke ranks with his party and announced that he would vote against Pashinyan’s candidacy drawing the rebuke of his colleague, ARF Bureau member and fellow lawmaker Armen Rustamyan who publicly denounced Vartanyan saying that the latter’s posturing cane as a surprise and pledging organizational ramifications. Moments later the ARF Supreme Council of Armenia issued an announcement calling on Vardanyan to step down from his parliamentary post. “The ARF Supreme Council of Armenia announces that ARF parliamentary faction member Aghvan Vardanyan’s decision was a personal one, which is not in line ARF’s official stance,” read a part of the announcement released by the Supreme Council. “There has been a gross violation of [party] discipline, which will be investigated. 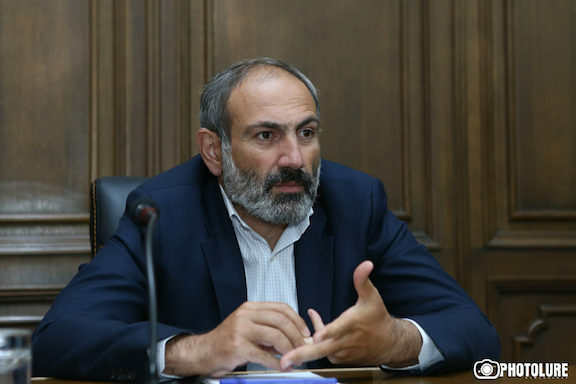 Accordingly, the ARF Supreme Council of Armenia calls for Aghvan Vardanyan to step down from his parliamentary post,” the announcement concluded. Pahinyan left the parliament building not defeated but with a great resolve to continue the campaign for change he started almost three weeks ago. He emerged at Republic Square to to the cheers and greetings of the thousands of supporters gathered there since the early hours of Tuesday. He thanked those who voted for him and vowed told his supporters to continue what they have started until next Tuesday when the National Assembly will once again convene to vote for a prime minister. This is what I am talking about. Only protesting will never solve any crisis. Yerevan must now build up the new government that will be able to lead the country. Street protest alone is not enough. Armenians in the diaspora can help Yerevan if needed. Must have something to do with the “closed door meet” up in Moscow. His closing speech was fantastic, and full of clever thoughts.That was the only one which hit me. Others were cliche, and ordinary. He showed that he is really intelligent and knows how to put the nail wherever is needed. The ARF is in complete disarray. Their initial mistake is now taking on a snowball effect. Internal strife will eventual erode their stance in the country. Eventually, they will end up like the Ramgavar party who’s only followers and constituency can be found in the diaspora. Until and unless the ARF comes clean to express gross incompetence in having created this crisis, the political vacuum will ultimately consume them.